Galerie Lelong & Co. is proud to present a solo booth of paintings and works on paper by American artist Mildred Thompson for the 2018 ADAA Art Show. Underrecognized in the United States during her lifetime, this presentation at the ADAA marks the solo debut of Thompson’s work in New York in conjunction with an exhibition at the gallery. The booth will highlight paintings from the Magnetic Fields series, a significant body of work that illuminates key characteristics of the artist’s decades-long practice. Thompson created Magnetic Fields between 1990 and 1992 in Atlanta, Georgia, soon after returning to the United States following many years abroad in Europe. Melissa Messina, Curator of the Mildred Thompson Estate, writes that these works: “mark a homecoming, a stability and structure Thompson created from which to hone the experiences and knowledge she cultivated throughout the first half of her adult life.” Magnetic Fields reflects this feeling of permanency as it is the first series in which the artist began working on a larger scale and creating works on multiple panels, such as the diptych that will serve as the focal point of the booth. In a 1992 artist statement, Thompson wrote: “Years ago, I had a dream about an event in space . . . feeling fortunate to see this event, I stayed to look at it in detail.” She was deeply interested in physics and astronomy and sought to visually represent invisible scientific theories and systems through her own interpretation. Thompson visualized magnetic fields as yellow, a color that serves as the universe upon which dynamic forces in red, orange, purple, pink, and blue are momentarily suspended in motion. A selection of Untitled pastels from 2003 will also be on view. These drawings are the last works Thompson ever created and demonstrate her exploration of an exceptional visual vocabulary and mastery of color across different mediums and decades. Concurrently with the ADAA Art Show, Galerie Lelong & Co. will present Mildred Thompson: Radiation Explorations and Magnetic Fields, the first solo gallery exhibition of Thompson’s work in New York, on view from February 22 to March 31, 2018. An exhibition catalogue will be published with essays by Melissa Messina, the exhibition’s curatorial collaborator, and Lowery Stokes Sims, Curator Emerita at the Museum of Arts and Design. The gallery announced exclusive representation of the Mildred Thompson Estate in 2017. Mildred Thompson was born in 1936 in Jacksonville, Florida, and died in 2003 in Atlanta, Georgia. She earned her Bachelor of Arts degree from Howard University in Washington, DC in 1957, under the tutelage and mentorship of the pioneering African American art historian James A. Porter. In 2016, the solo exhibition Mildred Thompson: Resonance, Selected Works from the 1990s was presented at the SCAD Museum of Art, Savannah, Georgia. Magnetic Fields: Expanding American Abstraction, 1960s to Today, an exhibition titled after Thompson’s major series, was recently on view at the National Museum of Women in the Arts, Washington, DC, where it traveled from the Kemper Museum of Contemporary Art, Kansas City, Missouri. 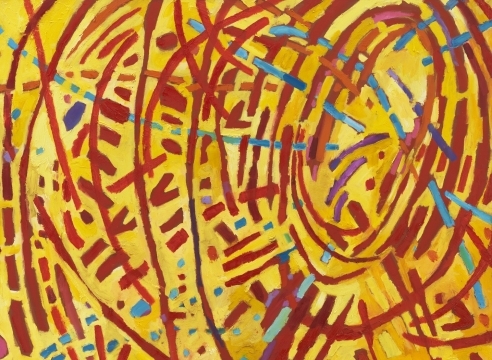 Thompson’s work can be found in numerous private collections in Europe and the United States, including Larry and Brenda Thompson’s prestigious collection of African American Art as well as the Mott-Warsh Collection in Flint, Michigan. Her work is also in many public collections including the Brooklyn Museum, New York; Museum of Modern Art, New York; National Museum of Women in the Arts, Washington, D.C.; New Orleans Museum of Art, Louisiana; and Smithsonian American Art Museum, Washington, DC, among others.